Thank you for supporting the Humpty Dumpty Foundation, SIDS and Kids and the Cure Brain Cancer Foundation in 2014, with your support we have raised more than $16,000 which was shared between the three charities. The funds raised from the display this year that have been allocated to the Humpty Dumpty Foundation will be used to buy a Rad 7 Pulse Oximeter for Mona Vale Hospital’s, Children’s Ward. This medical device will improve health services on the Northern Beaches and provide medical staff with a device that ensures the correct and safe delivery of oxygen during highly critical times in an effort to prevent damage to organs such as the brain, eyes and lungs. The funds raised to support the work of SIDS and Kids will provide around 500 hours of bereavement support to those who experience the death of a child. The funds raised to support the work of the Cure Brain Cancer Foundation will be allocated to fund medical research projects to find a Cure or Treatment for Brain Cancer. This photo shows the Display Owner Michael Grey handing over a cheque worth $4,100 to Angela Garniss - General Manager of Humpty Dumpty Foundation which was their share of the total funds raised of $11,600. With the $4,100 they were able to purchase a Low Flow Micro Blender for Bankstown – Lidcombe Hospital's, Birthing Unit as it was the highest priority item required that could be purchased with the fund raised amount. The remainder of the fund-raised amount is divided between our two other display charities. 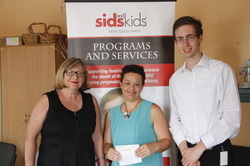 This photo shows the Display Owner Michael Grey handing over a cheque worth $4,100 to Jenny Clarke and Janet Grima from SIDS and Kids which was their share of the total funds raised of $11,600. The remainder of the fund-raised amount is divided between our two other display charities. This photo shows the Display Owner Michael Grey handing over a cheque worth $3,400 to Emily Dougan - Event Coordinator for Cure Brain Cancer Foundation which was their share of the total funds raised of $11,600. The remainder of the fund-raised amount is divided between our two other display charities. 2012 Display Fundraising Total $10,350 - for Cure Brain Cancer Foundation and Sids and Kids NSW and Victoria. In total we raised $9,550 through the collection box in the front yard of which $4,775 was donated to Cure Brain Cancer Foundation. An additional $800 was provided to Cure Brain Cancer Foundation through the sale of the Christmas charity CD's, totaling a total of $5,575. In total we raised $9,550 through an collection box in the front yard of which $4,775 was donated to Sids and Kids. The Cure Brain Cancer Foundation (formally Cure for Life Foundation) is one of the largest active fundraisers for brain tumour research and awareness in Australia. Established in 2003 by world renowned Neurosurgeon Dr Charles Teo, Cure Brain Cancer Foundation is making a major contribution to research in the treatment of brain cancer. Brain tumours affect the lives of ordinary Australians and their families every day. They can affect anyone at any time. For children, they are the most life threatening form of cancer and are now the most common form of all childhood cancers. While advances in neurosurgery give people a better chance at survival, the cure can only be achieved through further research. Research will allow us to understand this devastating disease and move closer to finding new treatments, improving current options and enhancing the quality of life for patients with brain tumours. Cure Brain Cancer Foundation vision is to accelerate a cure for brain cancer. --- Brain Cancer is the most underfunded and understudied of all cancers. --- It can happen to anyone at any age. --- It is now the leading cause of cancer death in children. ---The leading cause of cancer death in males under 44. ---The second leading cause of cancer death in females under 44. ---Only 25% of brain cancer patients will live for more than two years. SIDS and Kids provides bereavement support for individuals and families who experience the death of their baby during pregnancy, birth, infancy and childhood. This includes miscarriage, stillbirth, neonatal death, sudden infant death (SIDS) and the death of a child for any reason up to 6 years of age. Through our key services of education, training, bereavement support and advocacy, we help support many individuals and families in their time of need. SIDS and Kids focus is on education through programs such as the Safe Sleeping Campaign which has significantly reduced the incidence of SIDS over the last ten years. Together we can make a difference in lives of people who experience the tragedy of the death of their baby or child. Your support enables us to support others. 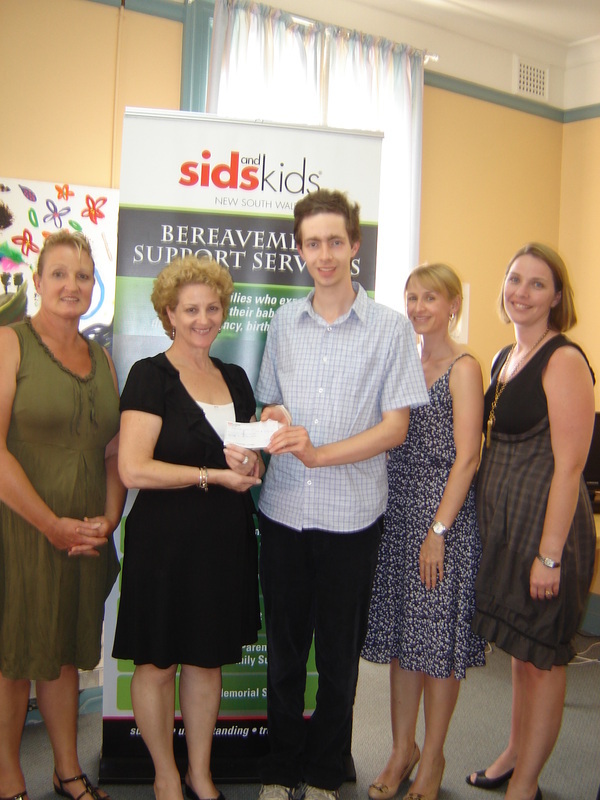 2011: SIDS and Kids NSW and Cure Brain Cancer Foundation Donations Total $8,000! On Wednesday 11th January The Display Orgainiser Michael Grey is handing over a Cheque for $3,760 (Cure Brain Cancer Foundation's Share of the total $8,000 amount which is shared with SIDS and Kids NSW ) . 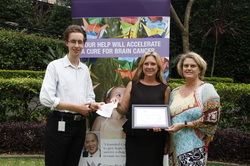 the cheque was handed to to Catherine Stace the Chief Executive Officer of Cure Brain Cancer Foundation. in addition to the $3,760 amount donated to the Cure Brain Cancer Foundation was the money donated from the Charity CD sales supplied by the Christmas Shop at Ramsgate. 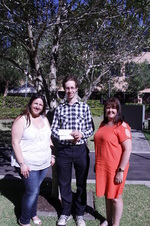 We would like to give a huge thank you to everyone who came in 2010 and donated to the National Stroke Foundation and Arthritis NSW Foundation, We raised a total of $4,000, so that means that both charities received $2,000 each. With your kind support we managed to raise $1,800 more than in 2009. 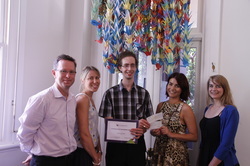 In 2010 Cambage Christmas lights proudly supported the Arthritis NSW Foundation and National Stroke Foundation. We were collecting for these charities to support people that suffered from these diseases like my grandpa and grandma did. We were collecting the donations on site. The onsite collection box will be located in the same place as previous years near the arch in the front yard. We do this display for a number of reasons to benefit those in need and to provide a opportunity to enjoy the Christmas season for all ages as our display has a number of different features for all ages.